During our recent weeks holiday in North Cornwall we came upon this site. 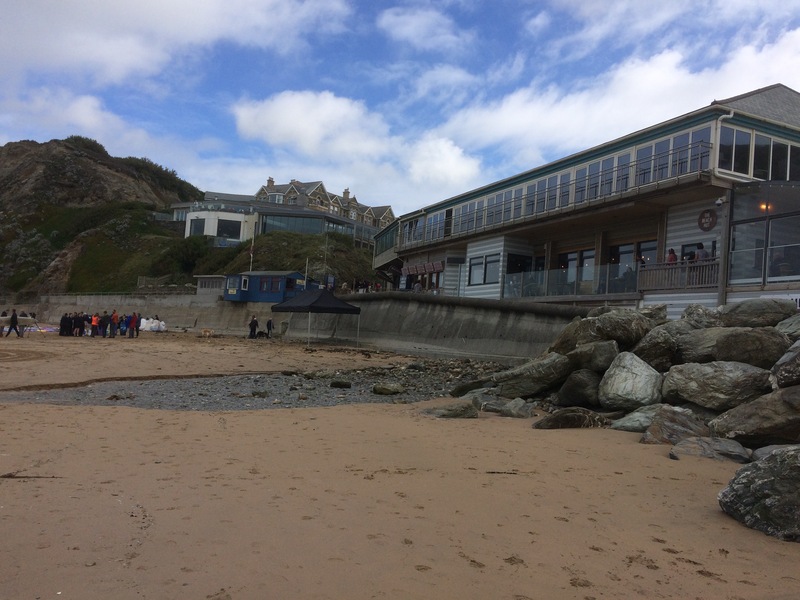 Quietly enjoying breakfast at The Beach Hut at Watergate Bay, we noticed what seemed to be a mermaid on the beach. It turned out to be a professional surfer doing a spot for the local news. 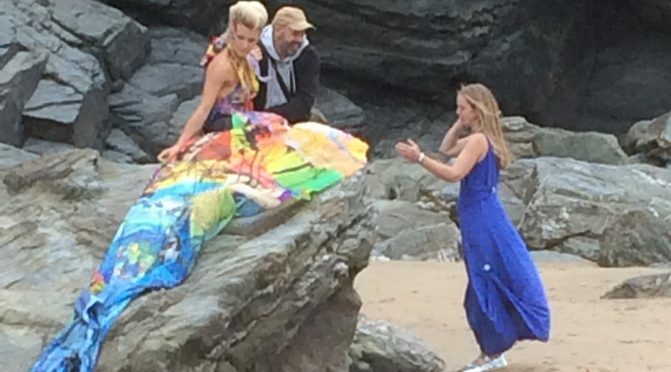 Her outfit was made from discarded body board covers to publicise the fact that they often end up in the sea and damage the environment and wildlife. Anyway the photo shoot and filming provided some light entertainment, while enjoying our full English. Selling Blinds is what makes these breaks possible so if you would like a quote fill out the form on this page and I will get back to you. 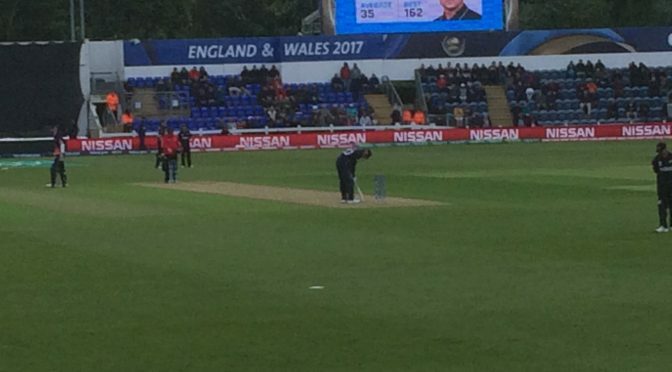 In June I took a day off to go and watch England open the Champions Trophy Cricket Tournament at Cardiff. .. 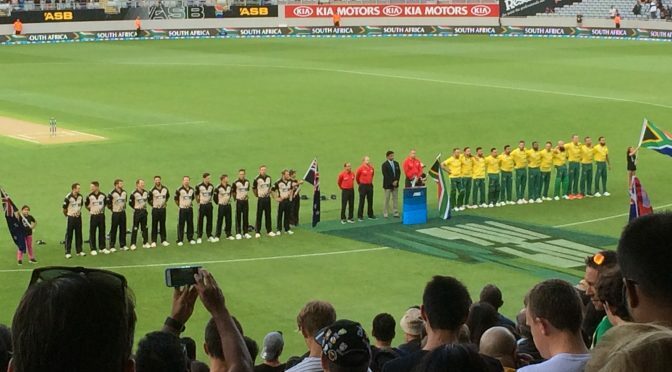 It was a great days entertainment, if very cold for June, with England coming out victorious. I love that being my own boss enables me to take odd days like this now and again. It also recharges the batteries for my return to work. So, if you would like some advice or a quote on Blinds, fill out the form on this site and I will get back to you. 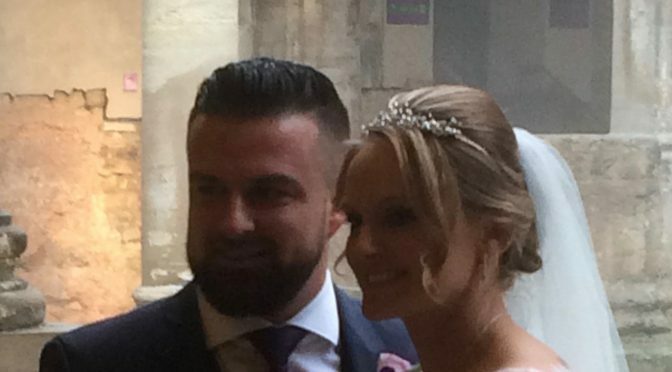 In November 2016 my eldest son Matt got married to Emma and now lives in Melksham in Wiltshire. It was an unusual choice of venues, but it really worked and was a fantastic day. The actual ceremony was performed in The Roman Baths in Bath and following that we spent the afternoon in a private box at Ascot Races. The food was good and the racing exciting, although my small win on the last race didn’t make up for my losses on the previous 6. 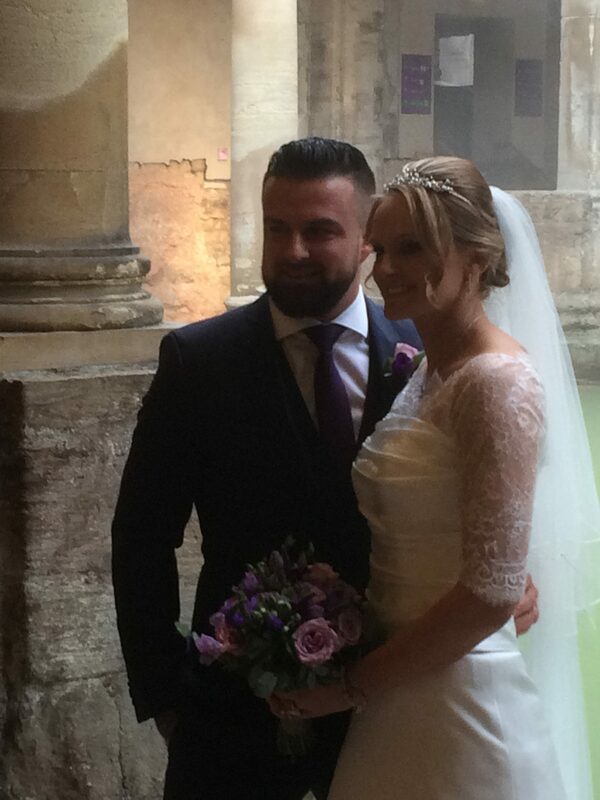 The bride looked beautiful and I’m sure they’re going to have a wonderful and happy life together. 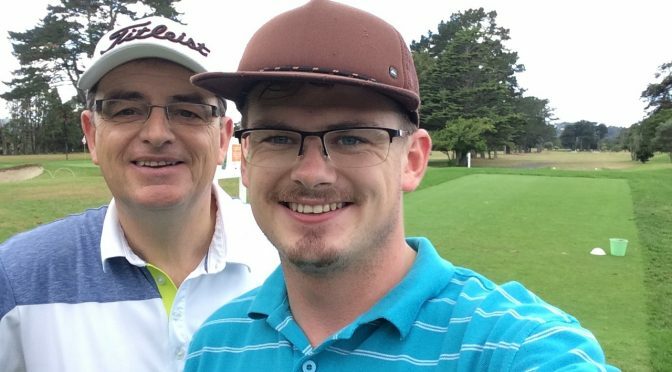 The other bonus was that my other son, Nick, travelled back from New Zealand for the wedding and some family golf, aided by the bank of Dad, Matt and his Mum. 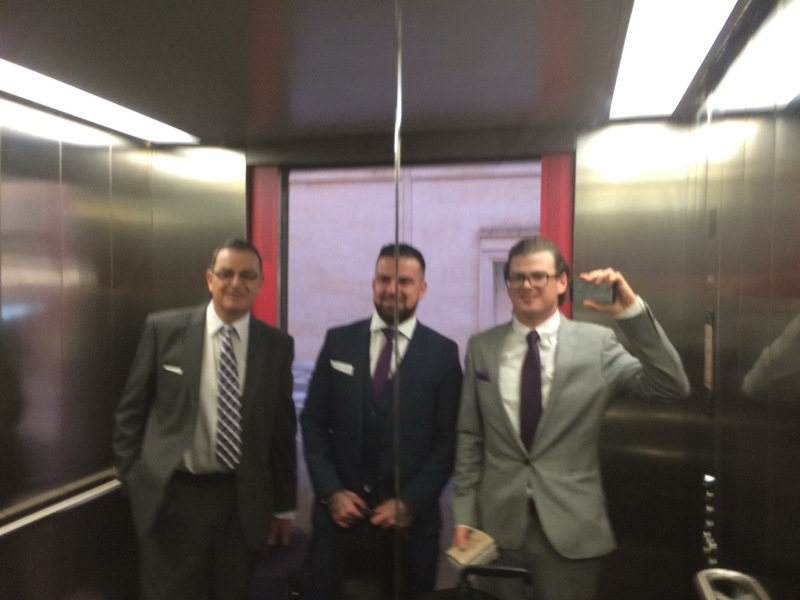 Sorry that the photo of the 3 of us is a bit blurred, but it was taken in a lift mirror. Remember if your want a quote, or just some advice, give me a call or fill out the form on this web site and I will get back to you. When Alan & Suzie recently got married and moved into Alan’s house, they decided to completely refurbish the property. They started with the windows and I was happy to help by fitting White 50mm Wooden Venetians at all the main window plus a Faux Wood Venetian in the kitchen and a pretty Roller Blind in the bathroom. If you are refurbishing your property and want some advice or a quote for Blinds, fill out the form on this site and I will get back to you. Bi-fold doors are becoming more and more popular these days. However sometimes it can be difficult to find the right Blinds, especially if the doors fold inwards. The ideal solution is Perfect Fit Blinds, whether Pleated or as picture here, 25mm Venetians. This enables the doors to fold back with the Blinds in place. If you would like some advice or a quote for Blinds to Bi-folds, fill out the form on this page and I will get back to you. 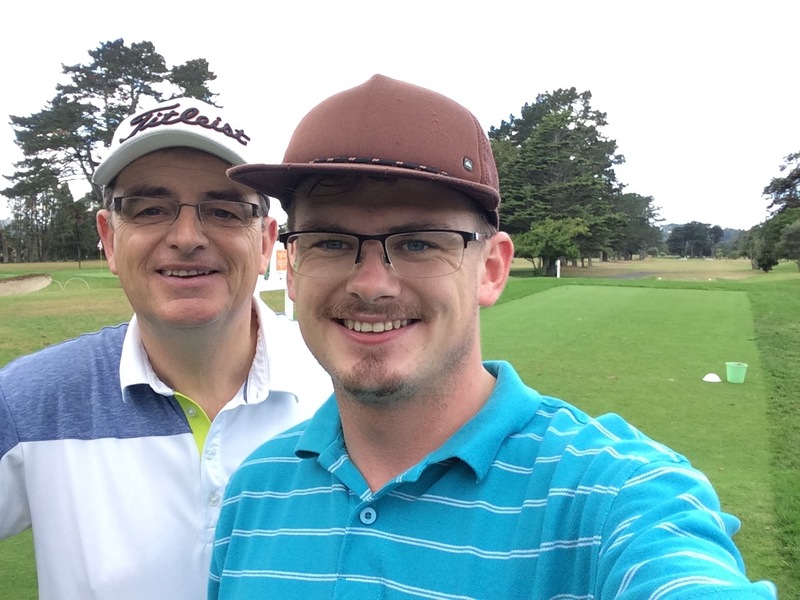 As part of visiting my son, Nick, in New Zealand, I was able to take his golf clubs out to him. This enabled us to renew our family rivalry on the golf course. 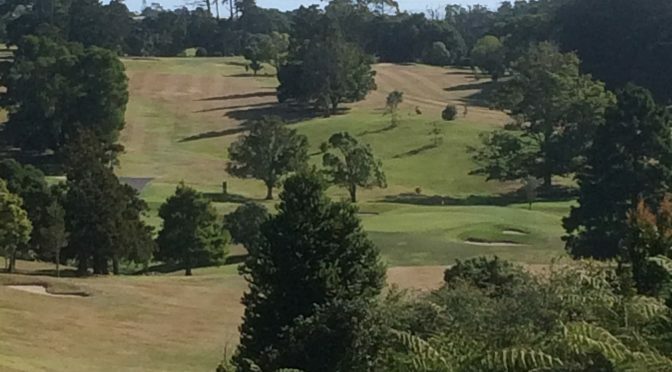 We played 7 games in total, all in beautiful mid summer conditions (February in UK), on some top quality golf courses. I started slowly and by the last week was 3-2 down with 2 to play. The golf, by both of us, had been a mixture of brilliance and utter rubbish to that point, but with victory in Nick’s grasp, I found a very windy day, on a tough course, the time to find my true form. I managed to shoot a gross 72 on a par 71 course to level the series. The final game was the closest match of the lot and ended on the final green where I just missed a ten foot putt to lose by one hole and so give Nick overall victory 4-3. I’d like to say I was being a good Dad and missed that putt on purpose, but those who know me, including Nick, know I really wanted that putt! We now plan for the next challenge to take place in either Ireland or Scotland sometime during the summer of 2018. I’d better start selling some Blinds and saving. On that note if you would like a quote, or just some advice, give me a call or fill out the form on this web site and I will get back to you. Having watched some cricket and played some golf with my son Nick, we set off on a mini road trip for a couple of days. We took in the lakes at Rotorua and Taupo and experienced some of the most stunning scenery you could wish to see, anywhere in the world. It really is a beautiful country with the most friendly people you could wish to meet. 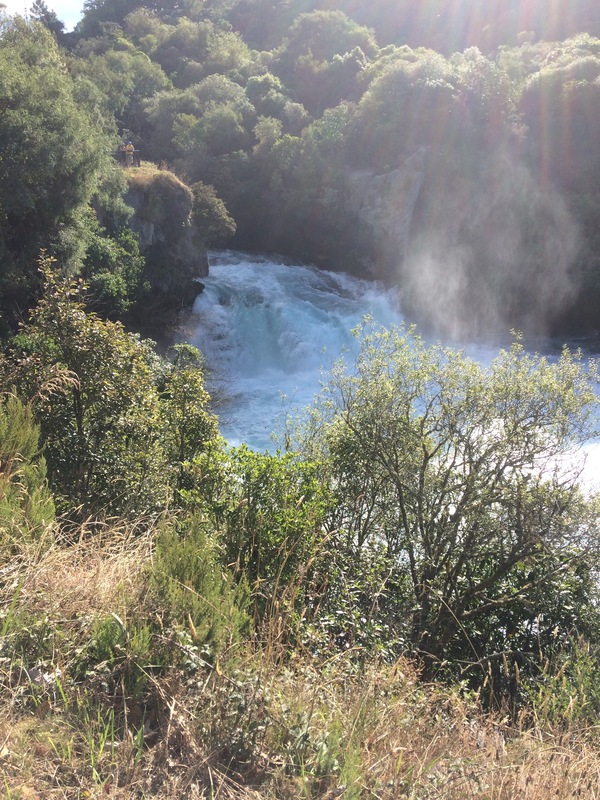 Everywhere we went we found stunning mountains, beautiful countryside and spectacular waterfalls. Amazingly I only experienced North Island. Apparently the scenery in the South is even more spectacular. Hopefully I can see that one day. 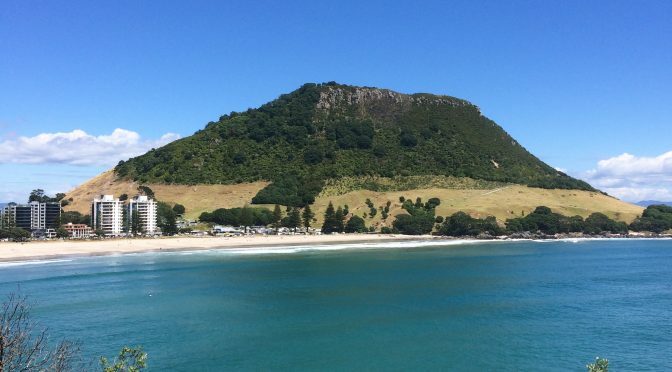 The main photo on this blog is of my base for my stay, the coastal holiday town of Mount Maunganui. This was Nick’s home for the summer before spending his 2nd NZ winter in the ski resort of Queenstown, in South Island. When a customer recently asked me to shade their new conservatory, but also make it suitable to use as an extra bedroom, Perfect Fit Pleated Blinds in Black provided the perfect solution and also gave a stunning finish to their new room. If you would like some advice or a quote on Conservatory shading fill out the form on this site and I will get back to you. Work wise I did nothing during February 2017. 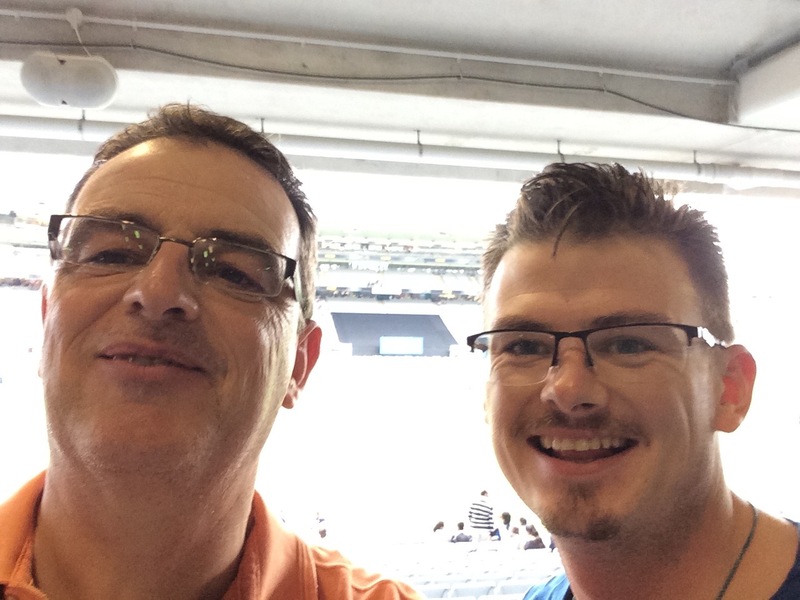 Not ill, not lazy, but visiting my youngest son, Nick, in New Zealand. Truly a trip of a lifetime. We started and finished the month with trips to Eden Park, in Auckland, to watch the New Zealand cricket team play firstly Australia and then South Africa. 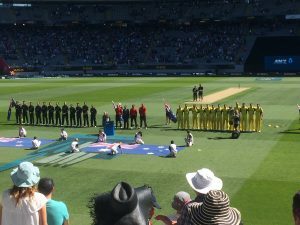 Saw some great cricket and had 2 great days out. Amazingly with today’s incredible technology, I was still able to book appointments for my return via email & text messaging. I just spent half an hour each morning catching up on phone calls & emails from the UK before setting off on that days adventure. They’ll be more about my travels in future blogs, but remember if you would like a quote, or just some advice, just give me a call or fill out the form on this web site and I’ll get back to you. Marina Bowling Club, in Dawlish, will be looking bright and fresh for the new season after being redecorated recently. The final touch being some Vertical Blinds and a Roller Blind, to the door, in Blue to match the paintwork. They looked lovely and the club were very pleased with their choice. If you would like a quote , or just some advice, please give me a call or fill out the form on this web site and I will get back to you.